For reference purposes, the following word-for-word history of Port Huron (city) is provided here. From the Combination Atlas Map of St. Clair County Michigan . . . by Everts & Stewart, Philadelphia, 1876, page XVIII. In the year 1819, when the Hon. D. B. Harrington came to this place to make it his abiding place, nothing but a vast wilderness met the eye on every side. The Chippewa tribe of Indians were the occupants of this region; and during the fishing and hunting season they congregated at the mouth of the Black River in large numbers; and their huts and wigwams dotted the shores for a long distance north and south. There were at this time a few French families scattered around, whose names are mentioned in the early history of the County, and who at times were seriously annoyed by the Indians. The propensity to steal was largely developed among them. The first house ever built in Port Huron, or, as it was then called, Desmond, was located near the Hogan House, in Court Street, and was occupied by Anselm Petit. The second building was occupied by a half-breed named John Riley, and was located on the site of William Stewart’s hardware store. These two buildings comprised the village in 1819. There were no inhabitants north of Fort Gratiot at that date, on the eastern slope of the lower peninsula, with the exception of three or four families scattered along the Black River and Mill Creek. On the Canada side a wilderness prevailed, with nothing to indicate the presence of humanity except the wigwams of the Indians. The village of Port Huron was originally in Desmond Township, embracing all that part of St. Clair county north of Township 5. The first meeting held to effect its organization was at Fort Gratiot, on the first Monday in May, 1826, when the following officers were elected: Martin Pickens, Supervisor; Jeremiah Harrington and Isaac Davis, Assessors; Morris McGarvey, Isaac Davis, and Richard Sansbury, Highway Commissioners; Reuben Dodge, Lewis Facer, and Francis Duchein, Constables. The first village plat was made in 1835, by Mr. E. Petit, and was called Peru. The next made was in the fall of 1835, by D. B. Harrington, and the lots sold by White & Harrington. In 1837 the third piece of land was platted and sold by Major John Thorn, and called Paris. The name of Port Huron is accredited to Mr. D. B. Harrington in 1835; and the projectors of the other village plats followed his example, and the whole assumed the name which it has since borne. The first school-house erected was by Francis P. Browning, and was located on the west side of the park and north of Black River. The first hotel built was of logs, in 1827, on Quay Street. Early map of Port Huron showing the park west of which was built the first school. This early era area of Port Huron is now taken up by McMorran plaza and the community college. 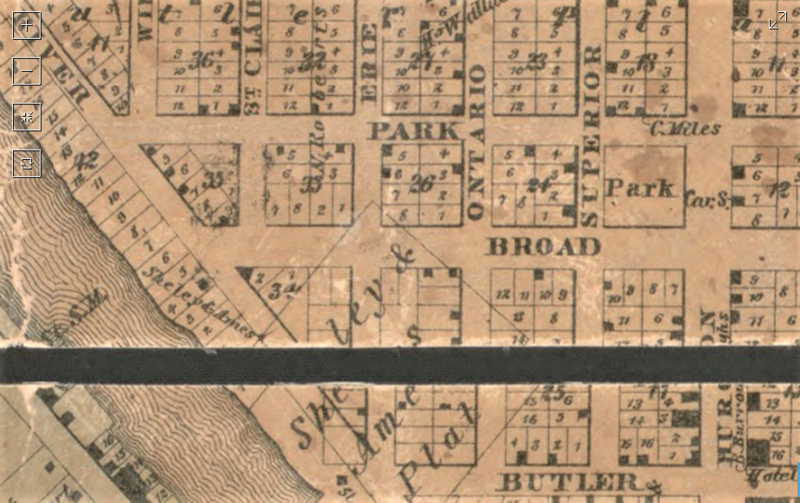 Detail from the 1859 Geil map of Macomb and St. Clair counties. In 1833 the road now known as Military Street was built, and a bridge erected across Black River. In 1832, during the Black Hawk war, the citizens of Port Huron rendered effective service in palisading the fort. John B. Phillips built the first steamboat at this place. The village of Port Huron became a city under a charter obtained April 8, 1857, at which time the City Council met for the first time, W. L. Bancroft presiding as Mayor. 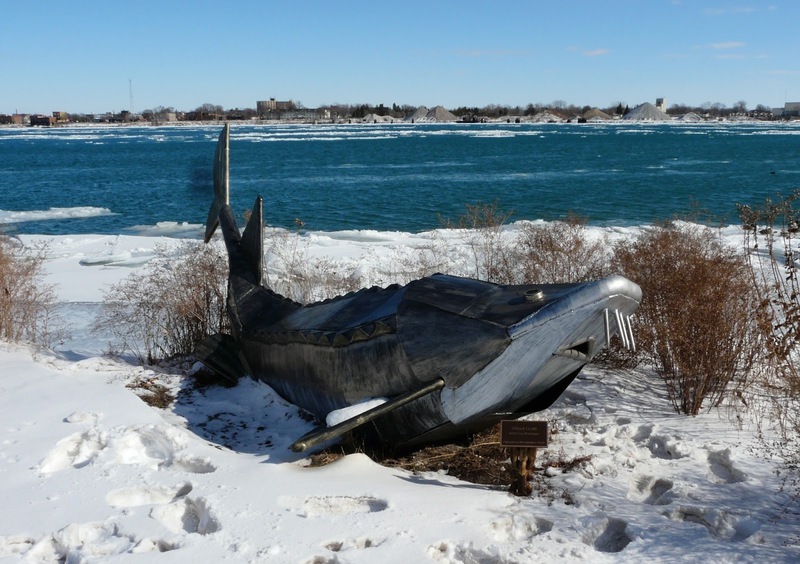 The city of Port Huron of to-day looms up grandly beside the little straggling hamlet that nestled on the shores of the St. Clair River forty years ago. The natural advantages possessed by this place surpass by far those of any other section of the County, and it is only a question of time when this city shall take a prominent position among the first cities of the State in population and business interests. It has a very large lake and river traffic, and the great railroad lines centering here bring a heavy trade to this point. The Grand Trunk, and Chicago and Lake Huron Railroads on the Port Huron side, and the Great Western Railroad on the Sarnia side, give to it an air of busy importance. For Gratiot is located on the northern limit of the city, and was occupied in 1814 by a detachment of United States regulars and militia, under Major Forsyth of the regular army. Captain Gratiot was the engineer officer who built the first fort, and after whom it is named. Its original cost was three hundred dollars. In 1822 it was abandoned, and the buildings turned over to two Presbyterian missionaries named Hart and Hudson, who occupied them until 1828, when they were reoccupied by the Government, and the buildings and grounds were enlarged and strengthened. The fort has since been occupied as a military post, with the exception of a period during the Mexican war and the war of the Rebellion [the Civil War]. The date of the first village organization is not clearly established, but from the most reliable information obtained, it was incorporated about the year 1842, and the first paper published was in 1835 or 1836, by D. B. Harrington, and was called the “Lake Huron Observer.” The most important business interests here are the cutting of lumber and ship-building, furnishing employment to large numbers of men. The marine interests of the city are large; many officers and sailors residing here with their families, and many vessels being owned here. A large wholesale trade is also being rapidly developed with the country north and west, especially in the grocery and hardware lines. This is the market for the produce of St. Clair, and large portions of Sanilac, Lapeer, and Macomb Counties. The city has a population of eight thousand three hundred, and is rapidly increasing. It is the County seat of St. Clair, and contains among its public buildings and enterprises three public or graded schools, two on the south side of Black River, and one on the north side; a very handsome structure occupying the site of the one burned in 1873, with two more contracted for, and to be speedily erected, one in the Fifth and the other in the Sixth Wards. A new city hall and court-house, and engine-house on Water Street, a new custom-house of elegant design, Pine Grove Park, city cemetery, now water-works building, all owned by the city, except the custom-house, which is a Government building. The fire department consists of one stream and one hand engine. The water-works are of the Holly pattern, with four engines, having a pumping capacity of three million gallons per day. The city is divided into six wards, with regularly laid out streets and fine side-walks, principally of wood. There are street railways, and the city is well supplied with gas. There are eight churches, two large iron bridges spanning the Black River, two lines of ferry-boats plying between Port Huron and Sarnia, Masonic, Odd-Fellow, Good Templar, and other lodges, besides stores, hotels, and shops in large numbers. The United States Signal Service Bureau have also established a station here, and render excellent service to the shipping interests. This entry was posted in Historic Preservation, History, Michigan, Michigan history, Port Huron, St. Clair County and tagged Great Lakes history, historical shipbuilding, lumbering industry, port huron history, St. Clair County history, thumb area history by porthuronhistory. Bookmark the permalink. Was there a cemetery on Erie street, po r Huron no that was moved in the 1800s? Hello. I see your specific comment at a different post and will comment more there.